This is what we're doing, but in raised beds. I'd love to have a garden the size of yours! Wow, a yellow two wheel wheelbarrow! You are just showing off! I have used mulch like that especially around tomatoes as you don't have to stake them but let them lay on the hay. The only down side in my garden was that slugs just love to live under mulch and come out to eat plants at night. So I don't mulch around the plants that they eat such as beans, lettuce and others. You reminded me of that chore on the list...get the planters ready in the garden. The plan here is just mixing in last years horse manure. I've got a nice sized pile of it in the garden area. Need to assemble several more raised beds too and hoping to get to it this coming weekend. Spring is right around the corner! Yes! Gardening! Unfortunately my garden is under quite a bit of snow right now...but I do like to think about planting - it helps me survive January...and Februrary...and March :-) Right now I am devouring the seed catalogs, and wishing that I had gotten more manure to put on the garden in the fall. But, I am ready for a new year! Maybe this is the year I will defeat the bugs and keep up with the weeds...ha! looks as if you will have a great garden when the time comes.... hope it will be soon! That is quite the process. Good luck next Spring! A lot of hard work but I know you and your family will enjoy the fresh veggies. I love that your kids help prepare the garden and that you have introduced them to a variety of foods at an early age. I really wish I had a gardewn like yours. I would have loved to jog and plant my fruits/veggies! Fun to start so early.Mine is covered in snow still. I'm still amazed the weather allows you to DO THAT right now. We're under a foot and a half of snow, so I can only lust over seed catalogs. Je gaat het wel heel groots aanpakken. Sounds great... Hope you can keep the weeds out... We have more than our share of those pesky weeds. Cold here this morning. Was MINUS 2 about 6 a.m. Yipes! gardening is a lot of work, I something like this in a garden a long time ago and the results were stunning everything grew higher and larger, you'll be well rewarded for all of your efforts at 2 Bears Farm and the Three Cubs! That is a large project! Good luck. My only thoughts on my garden now go to the plants I've been covering up from the freeze and hoping they make it. Still, I see weeds poking though. Hardy little devils. You have a nice area for gardening. Hope your layering process is successful! Je sens que les bonnes résolutions de début d'année vont t'amener à préparer un superbe jardin, encore une fois. Tous mes encouragements. It does look good. That's a lot of work but definitely worth it to keep those weeds out! It looks good so far! I've never tried this method before but know that others have had success with it. Good luck! Well, I thought I would rent a rototiller and disc up part of my meadow this Spring. Maybe try something other than Indian Corn, which is all I've ever successfully grown. I can't keep anything alive so no gardening plans for me. I'm very curious to see how this turns out. It does sound like you got a lot done! I wish I was as ambitious as you! I feel like I am doing good to keep my grape vines alive till spring...I can't grow anything anymore for the bugs and blights and blossom end rot, and chickens pecking away at my tomatoes. SIGH. We don't do much. Just a few plants on the deck. Wow,, your garden area is looking good! We never got anything cleaned up or prepped cause that time of year was when I got my boo boo's. 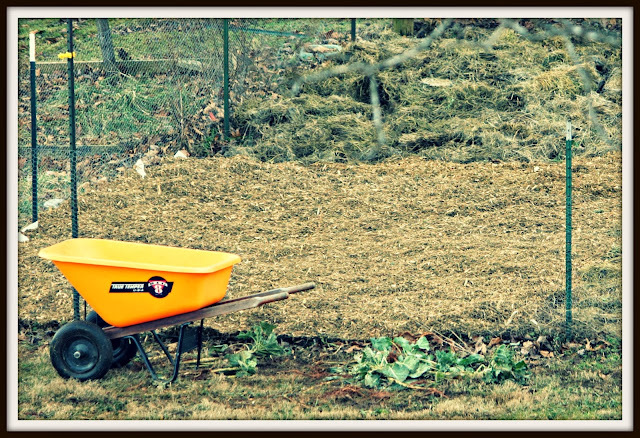 We will have lots to do when the thaws come..
You have a very pretty wheel barrow. I can wait to see your garden on the next spring. Not yet! Our harvest last summer was pretty meager. I don't have much luck with growing vegetables. I may try dirt-bag gardening this year. Learned of it from the Missouri Extension Service. You buy a few bags of garden dirt and throw them down, unopened where you plan to have the garden. then you cut small crosses through the bag to plant your seeds or starter plants. You water through each hole you made. The plastic warms the soil, keeps weeds from getting in and growing, and retains more moisture. After the season ends, you cut open the bag and dump the dirt into the garden. Okay. started to post a comment and just decided I am better off keeping my mouth shut on this one. But, puke? That would be easy. That garden corner looks great! I wish my garden looked that way. We have a large drift of snow on our garden right now. I did order seeds last week from the catalogue though. Nice prep work! It's looking good!